I’m pleased to share this guest article from Shel Horowitz, a business owner who knows the value of creating a better world for all. After the article you should watch his inspiring TED Talk on how smart businesses can create a healthier world. Most businesses leak huge quantities of heated air in the winter and cooled air in the summer. Simple and very inexpensive measures like insulating outlets and switchplates on outside-facing walls with foam gaskets (and plugging unused outside-wall outlets with baby outlet protectors) can make an immediate difference. So can making sure windows are properly caulked. And ensuring that doors to the outside close tightly and have weather-stripping and heat-trapping rubber sweeps. Install programmable thermostats to stop heating/cooling air when the building is shut for the night and program them properly: no more than 68° F/ 20° C in the winter, no lower than 75° F/24° C in the summer during working hours, and perhaps 55° F/13° C in the winter and 85° F/29° C in the summer, from half an hour after the end of the workday until half an hour before employees start arriving in the morning. Plug computers, machinery, and appliances into smart power strips that eliminate “energy vampires” by cutting power to the device when it’s not in use and train your people to flip the power strips off if they’re the last to leave at night. Cut your paper costs by 40 percent or so by switching to duplexing (two-sided) printers and copiers, setting them to default to two-sided, and training your employees to use that setting when possible. Have a goal that the only single-sided copies are the last pages of documents with an odd number of pages. The amount of paper that can be saved will shock you. Of course, some few documents do need to be printed one-sided. But often, that’s because they’re going to be used as a reprint master which can be avoided by printing from a digital file instead of a hard copy, gaining higher quality in the process. Encourage employees to do more on-screen and print less in the first place. Demonstrate the computer settings that display larger print without changing the actual document (for instance, the View-Zoom feature in Microsoft Word and most Internet browsing software)this makes reading on the screen a lot more comfortable, and printing a lot less necessary. Recycle all the scrap paper in your office. Recycle plastic and metal as well. And switch to recycled copy paper, toilet paper, and paper towels; these days, the latter two don’t have to cost any more than non-recycled, and copy paper is only a bit more. Change your break room and lounges around with a goal of sustainability: Get rid of disposable cups and buy each employee a personalized coffee mug, plus a few for visitors. Use reusable rags and sponges instead of paper towels. Switch to organic fair-trade coffee, tea, and cocoa. If your business is in a place where the water is drinkable, add a water filter to the sink and educate your employees that using filtered tap water is much greener than bottled, as well as much cheaper for them. Partner with a local organic farm to offer a once-a-week farmers market in your parking lot or on a lawn, where employees can stock up on fresh organic veggies this costs you nothing, and your people will love it (especially if they live in cities). Switch to natural/organic pest control and landscaping. Install an aerator on every faucet. Next, look at steps you can take to make your employees more comfortable and happier, which in turn will make them more productive. Bring houseplants into work areas they chew up carbon dioxide (a major greenhouse gas) and turn it into oxygen. Provide natural lighting where possible. Use fresh air from open windows during the spring and fall, if your building is set up with windows that open. Use curtains and drapes to let in sun in the winter, block it out during the hot summer and to keep heat in during winter nights, while releasing it in summer. Set aside the money you save from these measures to look at more complex steps, such as adding more insulation, auditing your manufacturing process for energy savings, switching to low-water or even waterless toilets, planting an area of your roof or adding solar panels, going through the LEED or EnergyStar certification process, and so on. And don’t forget to start talking about all the green things you’re doing in your marketing, on your website, and in your press releases. The marketing benefit alone in some cases, can be enough to cover the capital cost of the next round of improvements. 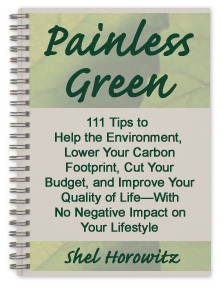 Shel Horowitz, shel at greenandprofitable.com, shows you how to reach green, socially conscious consumers with marketing that has THEM calling YOU. A popular speaker and the primary author of Guerrilla Marketing Goes Green (John Wiley & Sons, 2010), he is available for consulting and copywriting on green business/social change business profitability and marketing. Visit him online at http://greenandprofitable.com or call 413-586-2388 (8 a.m. to 10 p.m., US Eastern Time). If you want to “Be the change you want to see”, check out the Change is Up To You Project. Previous postU.S. Courts Punish Victims of Domestic Violence and Allow Abusers to Walk Free!